Former storefront, ground-floor of an abandoned late19th-century Greek-style apartment house, Tahtakale quarter, Eminönü, Istanbul, 2012. (Fuji X100). Click to enlarge. 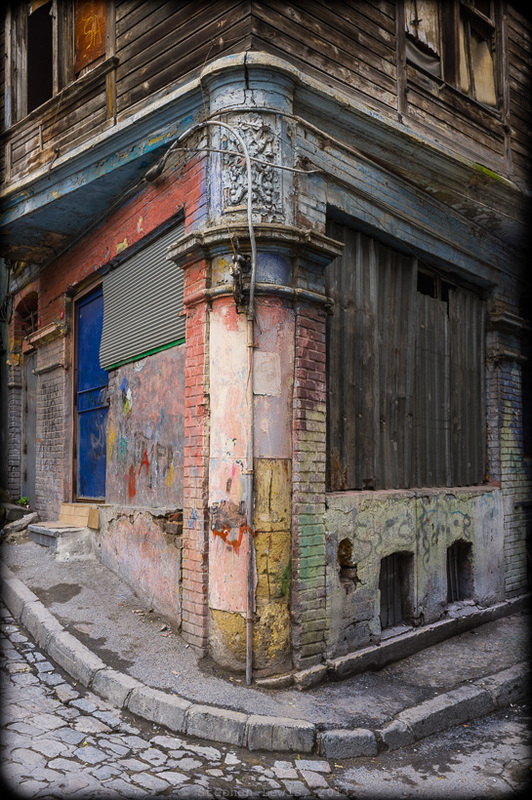 A boarded-up storefront in a boarded-up building, a ghostly survivor in a once-thriving neighborhood. The brick façade of the ground floor and wood-plank-covered exterior of the upper floors suggest that the building may have been built and owned by Istanbul Greeks a century to a century-and-a-half ago. fantastic. i’ve seen other old wooden buildings like that in istanbul, which i was told used to belong to greeks. they’re beautiful; i hope they survive.